Becoming a Mom has brought about change in every aspect of my life, and my personal style definitely did shift a bit upon Henry’s arrival. For me, there’s two sides to it; I have less time to spend getting ready, but with this change comes more of an appreciation for the time I do have. I treasure those moments I get to spend on myself- the primping, the prepping…even curling my hair feels that much more indulgent. 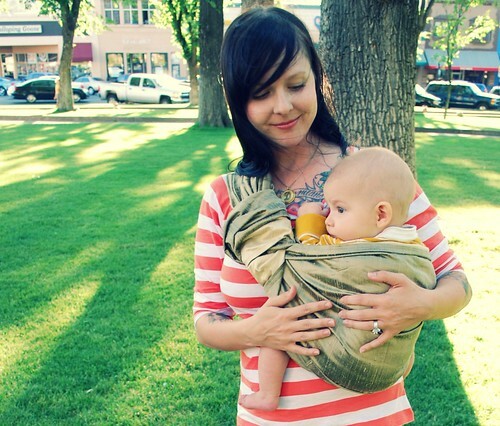 Clothing choices now come with questions too: will I be breastfeeding while out? Will Henry be awake or asleep, climbing all over me or in his stroller? Will I be wearing him in his sling or will Hank have him in the carrier? My style for the day is a reflection of me, but it is also in direct correlation to my son. He is as much a part of my style as I am, and with this comes the necessity to be sure I remain true to myself and not get lost in the hustle, the bustle, and in adapting to what’s easy but not necessarily what makes me feel my best. It’s important for me to still dress up and feel pretty. And when I feel pretty, it makes me happy…and really, a happy mama means a happy family. Getting dressed is so much simpler now because well, I feel so much more beautiful! I never expected to feel this way after having Henry, and to be honest, I was worried I’d feel unattractive as I got used to my new body and slightly different shape. But with childbirth came a new respect for myself. I feel proud of what I accomplished, and I believe that this newfound, deeper self-love has become an integral part of my style. Besides, accessorizing with confidence is always in, and with it comes a new willingness to try out different styles and have even more fun playing dress up on date night. 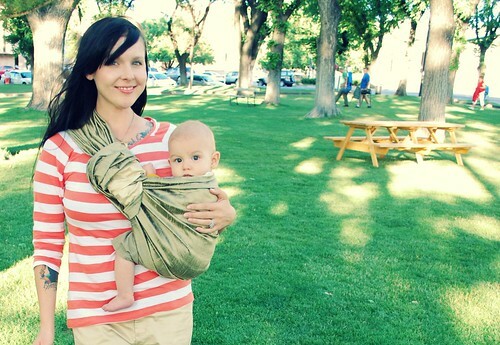 My personal style’s always evolving, but I’d say this new love-based, Mom-style is the best one yet. Read more about the Sakura Bloom Styleathon here! oh i soooooo agree! tallulah dictates what I wear as I always have to think about nursing etc! but it also has made me try a little harder not to schlep around in trackypants etc! henry is adorable! Oh, how I miss babycarrying! you are such a beautiful family!! 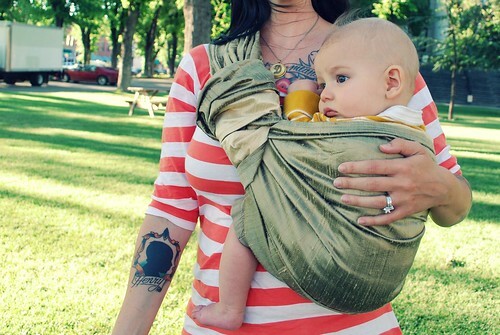 your little henry looks so cute in the sling and is definitely your sweetest accessory! still trying to figure out how to balance the comfy aspect without letting it override the level of cuteness when picking out my outfits! It's hard to do! Sometimes I feel like if it were socially acceptable, I'd seriously contemplate cutting two breastfeeding holes in one of my husband's soft cotton t-shirts and I'd just wear that all day. And that is sad, but true. I'm nowhere near having kids at the moment but love reading your perspective! You look amazing! Arghhh! Thank you for this post! My girl is six months old next week and I'm having a really hard time getting back into the style swing of things. I trudge around in jeans and a t-shirt and sneakers all day and feel positively unfabulous. I mean, my jeans, t-shirt and sneakers are all pretty cool, but I really don't feel girly at all and I miss that. Really good post.its full of feelings.Mom is like a second god. oh I love this post! You and Henry are gorgeous. You look great after having a baby! I'm always wishing I had your entire wardrobe too, you've got great style :) Henry looks so cute in those pictures by the way!! Yeah the color on that carrything is very hip. If I was a parent I'd use THAT one. You stylish mama, you must live in NYC or somethin'. The shorts are darling. I have sort of convinced myself that shorts are unflattering on me - I think I need to reevaluate! 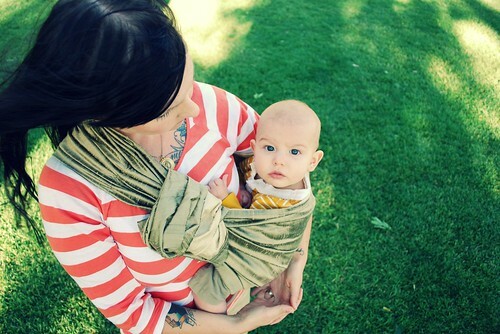 I am in love the photographs of you and your baby! Your sling is so pretty as well! You look lovely! I love Henry's little facial expressions. He has really interesting eyebrows (which may be weird to say, but it's true). You look so pretty and care free! You radiate! That's what the love for & from a child can do to us...it just makes us beam from our core. & it changes us. You look different...better. Not that you weren't something to stare at before, but the mommy glow, you're working it. You just look extremely happy, at ease & right where you belong. Great post Danielle. I think that a lot of mommas and mommas-to-be need to hear things like that. And great outfit! oh man, I am glad that I'm not the only one who would dress based on nursing accessability and if it matched my baby carrier. I love your sakura bloom sling!! 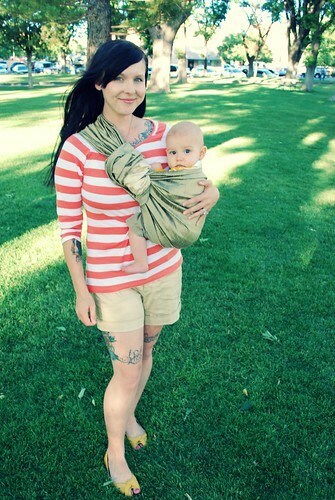 I neved used a sling with my son (always a wrap or a mei tie) but I think with this baby I might invest in one! Also, I put your button on my blog, I hope thats ok! It was really awesome to see your kid and you in this pictures. Looking great. I agree with everything you said, Danielle. I also worried about my confidence after baby, but I feel more beautiful than ever. There is something truly inspirational about what a woman's body is capable of doing. After seeing my body change and grow for 9 months and then safely deliver a healthy baby it had made on it's own, I don't think I could ever feel insecure about it again. that baby sling is so cute! I am in love with your silhouette tattoo, and you wear your baby quite well. Lovely! oh I love your little henry tattoo! It's such a lovely idea.